A job listing on LinkedIn hints at multiplayer support and levels within Electronic Arts' sequel to Dead Space. 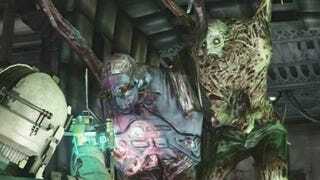 A tipster to Joystiq pointed out the advertisement for a "Senior Online Level Designer," and it's set off alarms all over that you'll be doing some strategic dismemberin' with and/or of your friends in Dead Space 2. The person hired for this job must "own the level design for the online game [and] be able to work collaboratively with Creative Director and Online Producer to create extremely fun, satisfying and polished multiplayer levels," according to the ad. For those of you not qualified for this job (like me), the rest of the listing gives up some details on where the game stands as of now. The game is in the later stages of pre-production, ready for production in the next few months, with many of the navigational and combat mechanics in place. We have complete autonomy and creative control over our own decisions. The Games Label at EA is 100% committed to this IP, and has already worked on IP extensions such as comic, animated features, and action figures.